Welcome to another of Organica J’s Top Ten Uses! Here I focus on 10 helpful uses for Lavender essential oil. Remember there are a lot of varieties of lavender, which have different properties and scents. Here we are talking on the variety lavandula angustifolia (true lavender). I have found after much experimenting with other varieties from various countries, to use a French lavender, which I personally like best for therapeutic use and in my products for what I need from its properties, and with its soft, but powerful fragrance. Lavender is an aromatic evergreen shrub and the oil is made by steam distillation of the flowering tops. It is colourless or pale yellow in colour. I use lavender in many of my products, such as my Gardener’s Hand Balm, Restful Evening Bath & Body Oil and Pulse Point Roller Ball , Lavender and Lavender flower Soap as well as being one of the ingredients in my Meditation Essential Oil Blend. It blends so well with many oils. I have used it recently in therapy blended with roman chamomile, sweet orange and ylang. There are many different uses for lavender oil, it has been used for a long time for numerous things, but I include what I view as my top 10 uses. 1. Can reduce stress levels. 2. For insomnia and disturbed sleep. 3. Relief from muscular aches and pains. 4. Can calm anxiety & eases fears. 5. Easing headaches (rub one drop on temples) . 6. Very helpful for minor burns. 7. Relief from colds and flu. 8. A good insect repellant. 9. Helpful for pmt and menstrual cramps. 10. Can provide relief from sunburned skin. 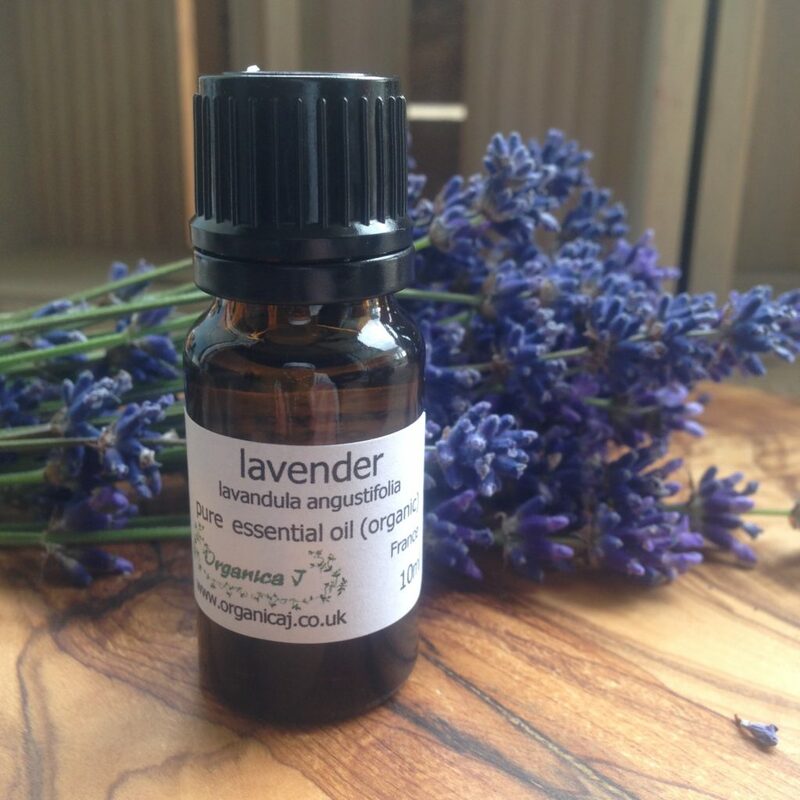 If you feel that lavender would be a useful oil for you, you can buy it here. There is also available a full range of other aromatherapy essential oils, with information on their uses available in the essential oil category on the website. 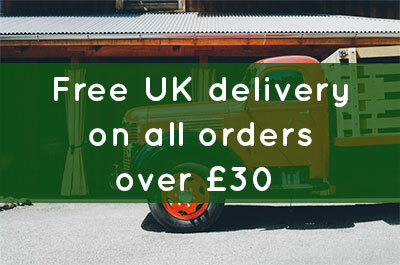 If you require further information on any oils, feel free to contact us by email or phone. 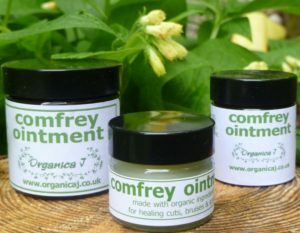 For using essential oils for specific or complex medical problems always contact a qualified aromatherapist or your GP. Welcome to another of Organica J’s Top Ten Uses! This month we will be focusing on 10 helpful uses for Sweet Orange essential oil. Working as a clinical aromatherapist, I use a lot for its sunny, relaxing, gentle but powerful action. It is good for using with vulnerable folk, such as the young or elderly because of these properties. I used it very regularly when I worked one day a month at a local residential home for the elderly, it was a popular choice there among the residents and staff alike. Sweet Orange has been a favourite oil of mine since I qualified and I have is a component of my Love Soap and Essential Oil Blend. Also of course in my Orange & Frankincense Soap, Essential Oil Blend and my Reflexology Foot Balm. Here are what I think are its top ten uses. For using essential oils for specific conditions always contact a qualified aromatherapist. 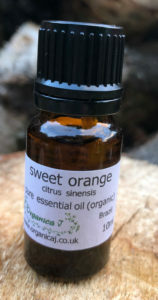 The organic sweet orange essential oil that I hold in stock right now is Citrus Sinensis. The sweet orange tree is a small tree and it was introduced to Europe by the Portugese early in the 16th century. Sweet orange oil is expressed from the ripe peel of the fruit and is orange. The scent is citrus and very sweet. My current supplies are from Brazil. If you feel that Sweet Orange essential oil would be a useful oil for you, you can buy it here from Organica J. There is also available a full range of other aromatherapy essential oils, with information on their uses available in the essential oil category on the website. Always use on the body blended with a carrier/vegetable oil. If you require further information on any oils, feel free to contact us by email or phone. NB if you have a medical condition/take medications check with your GP and/or a qualified aromatherapist before using essential oils. Welcome to another of Organica J’s Top Ten Uses! This month we will be focusing on 10 helpful uses for Grapefruit essential oil. Working as a clinical aromatherapist, I use a lot for its anti-depressant and uplifting properties, but also I use it for the treatment/management of cellulite in blends as well. It is a very ‘happy’ and ‘bright’ oil in my opinion and really helpful to use in the darker days. Here are what I think are its top ten uses. 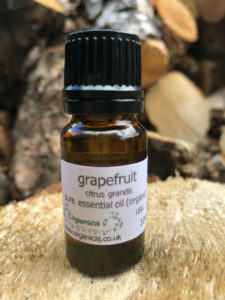 If you feel that Grapefruit essential oil would be a useful oil for you, you can buy it here from Organica J. Welcome to another of Organica J’s Top Ten Uses! This month we will be focusing on 10 helpful uses for Eucalyptus essential oil. Its one of the oils that we use in our Muscle Rub, along with Rosemary and Black Pepper – utilising Eucalyptus’ analgesic properties. Working as a clinical aromatherapist, I use eucalyptus often in blends for clients. The essential oil is often first thought of for respiratory issues, and its great action on muscular aches and pains is often overlooked. For a cold it is what I reach for first in a blend for steam inhalation to use the anti-viral properties, decongestant and to help ease difficult breathing that is often present when you have a cold. Here are what I think are its top ten uses. 10. On a subtle level it can help to cleanse negative energies. There are many varieties of Eucalyptus that can be used in aromatherapy – the Eucalyptus that I use is Eucalyptus Blue Gum, latin name eucalyptus globulus. Eucalyptus is indigenous to Australia and the oil is steam distilled from the leaves. There are other countries that produce the oil, i.e. China, Spain and Portugal. My current supplies are from China. If you feel that Eucalyptus essential oil would be a useful oil for you, you can buy it here from Organica J. There is also available a full range of other aromatherapy essential oils, with information on their uses available in the essential oil category on the website. Always use on the body blended with a carrier/vegetable oil. Welcome to another of Organica J’s Top Ten Uses! This month we will be focusing on 10 helpful uses for Frankincense essential oil. Its one of the oils that we use in our Meditation Essential Oil Blend and Orange and Frankincense Blend, both are ideal for ultimate relaxation. Working as a clinical aromatherapist, frankincense is one of my most used essential oils, I love it! and I find it so gently powerful. Helping with clearing the mind when over stressed or anxious and with moving forward in life. It is an ideal choice for meditation. I just couldn’t do without frankincense oil – I take it with me anytime I am away from home. Here are what I think are its top ten uses. 5. Can aid in the slowing down the appearance of wrinkles. 6. Soothing the pain of heavy periods. Frankincense’s latin name is boswellia carterii and is a natural resin from the exudate of the bark of the boswellia tree. The frankincense oil is steam distilled from the resin. Frankincense is sometimes referred to as olibanum, meaning oil from Lebanon. It has been used for centuries often as an incense in religious ceremonies. Kohl used as eyeliner by the ancient Egyptians was made from charred frankincense. My current batch comes from Somalia, which is my favourite Frankincense. In my opinion it has a delicate, deep scent, slightly musky in the most pleasant way. 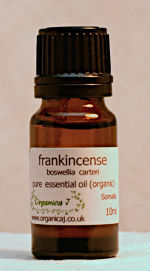 If you feel that Frankincense essential oil would be a useful oil for you, you can buy it here from Organica J. There is also available a full range of other aromatherapy essential oils, with information on their uses available in the essential oil category on the website. Always use on the body blended with a carrier/vegetable oil.